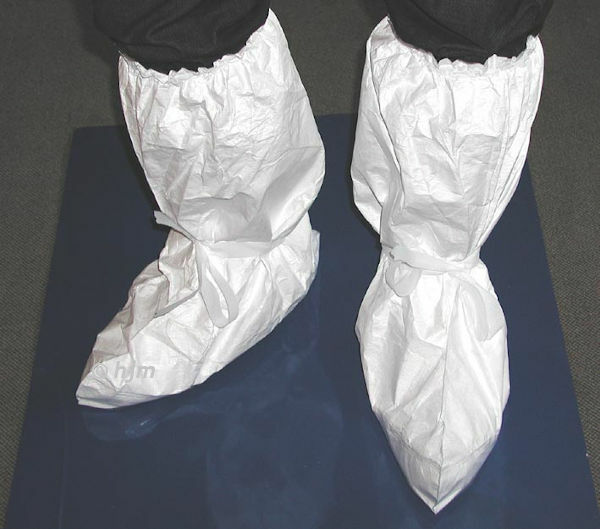 TYVEK cleanroom clothing is desingned for ISO class 7-8 cleanroom. Also it has antistatic properties. In dry or wet condition TYVEK remains equally resistant to tearing towards all directions. Down to a temperature of -73°C TYVEK also remains strong and flexible. A net of finest Polyethylene fibres ensures good bursting and abrasive resistance as well as an extraordinary resistance to further tearing. TYVEK-clothing can be worn and washed numerously. TYVEK is chemically and biologically fully neutral. The physical properties are not influenced by most of the organic and anorganic chemicals, including acids, bases and salts. During absorption of special organic solvents, slight swelling may occur before evaporation. When TYVEK is exposed to flames it shrinks quickly. When the flame follows the shrinking material it sets fire at a temperature of appr. 340°C. ETOK7PT25(size) Overall CLASSIC XPERT: With hood, elastic band at arm, leg and back, covered zip White S-XXXL 25 pcs. ETKRVTK1/(size) Coat: Collar, zip fastener, 2 bags, elastic band at arms White M-XXL 50 pcs. ETKA2T1450 Arm cuff: Made from PE, elastic band at both ends White Unisize 200 pcs. ETKSH55T14 Overboots POBA: Antistatic, anti-slip sole White Unisize 200 pcs. ETKSTF Apron TYVEK "F": With drop border, neck loop, to tie on the back Grey Unisize 1 pc.